Welcome to Dave's School of Taxidermy. You will learn skinning, fleshing, tanning procedures, form selection, alteration and carving fish forms. We will cover anatomy, design, composition, air brush painting and finishing techniques. We will work with habitat and base making, reference collection and filing, European mounts and skull preservation. You will learn how to build a custom glass case. I will teach you how to make and use artificial bird and fish heads, feet, and artificial antlers and horns. You will also learn how to mold and cast artificial fish, rocks, driftwood, and other habitat material. You'll work with fiberglass, bondo, and artificial water. Gameheads include but are not limited to: whitetail or mule deer, pronghorn, elk, moose. In order to complete this catagory, three species must be finished, whether its three whitetails or one of each. Class takes two weeks to complete. Birds include but are not limited to: pheasant, grouse, ducks, geese. In order to complete this catagory, one waterfowl specimen and one upland specimen must be finished. The student will do one flying and one sitting. Class takes two weeks to complete. 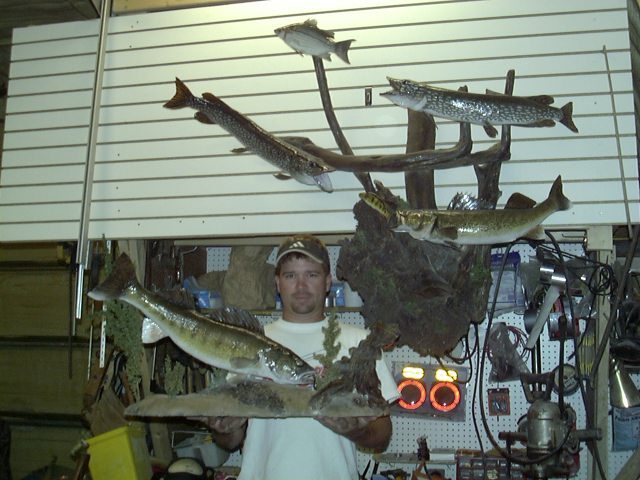 Fish include Freshwater and Replicas: pike, perch, walleye, crappie, bluegill. In order to complete this catagory, three gamefish specimens and three panfish specimens must be finished. Class takes two weeks to complete. Lifesize Mammals include but are not limited to: least weasal, badger, coyote, mountainlLion, bear. In order to complete this catagory, one lifesize mammal must be finished. Class takes two weeks to complete. This 2 week course is for those people who are only interested in one type of taxidermy, whether it be any one of the catagories. This course allows for enough time to complete all the requirements necessary for our school. The requirements for successful completion of the four week course is a completion of two catagories listed above. This four week course allows the student to complete two catagories. For example, a student could do gameheads and fish or gameheads and mammals or any combination of the student's choosing. Also if a student wants to get advanced training in the two fields of choice, he/she could also apply to the six week course to gain the knowledge and training to do so. (This student combined the fish and the gamehead classes. The requirements for successful completion of the six week course is a completion of three catagories listed above. This six week course allows the student to complete three catagories. For example, a student could do gameheads, fish and birds, or gameheads, birds, and mammals, or any combination of the students choosing. Also if a student wants to get advanced training in the three fields of choice, he/she could also apply to the eight week course to gain the knowledge and training to do so. The requirements for successful completion of the eight week course is a completion of all four catagories listed above. This eight week course allows the student to complete all four catagories. We suggest anyone interested in taxidermy takes this class. Also if a student wants to get advanced training in the four fields of choice, he/she could also apply to the ten week course to gain the knowledge and training to do so. The class schedule is 8:30am to 6pm, Monday-Friday.Because everyone learns at a different pace, we do not have a set class schedule. The only thing we do require is that everyone is there during the time we request. In order to finish things that can not be stopped, we must work a little later then usual. We are normally in the shop working late on taxidermy for our clients. If a student wants to work late or even just watch, they can. We never stop teaching and will be happy to show the students what is going on and why we are doing it. We encourage questions. We can be flexible and can tailor the course to fit your needs. If you have any questions or special interests, please call 1-800-566-7974. We are here to answer any questions you have. Your expenses will be the cost of any specimens you ask us to provide for you (bringing all your own specimens will reduce this cost dramatically). You will be responsible for forms, eyes, artificial parts you choose to order; (i.e.. turkey heads, jaw sets), wood trim for bases, glass for glass cases and your food. OPENINGS AVAILABLE NOW. Please contact us for details or use our enrollment form. Please give us a call and we can talk about your particular interests. Dave's School of Taxidermy can set up longer courses for those students desiring more instruction.